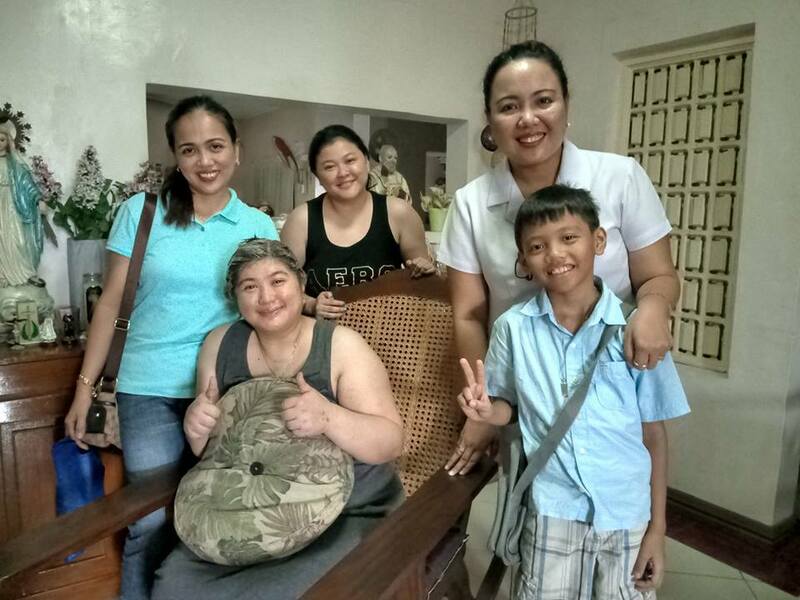 If there are things that keep 39-year-old Marie Anne Concepcion-Magpantay from giving up, it’s her untiring faith in God and unwavering support of her family and friends. Meanne (as she’s more fondly called) has been diagnosed with Myelodysplastic Syndromes (MDS), categorized as refractory cytopenia with multilineage dysplasia 2 percent blast in February 2016. It started with a feeling of dizziness, which she thought at first was slight anemia because her hemoglobin levels were always low. 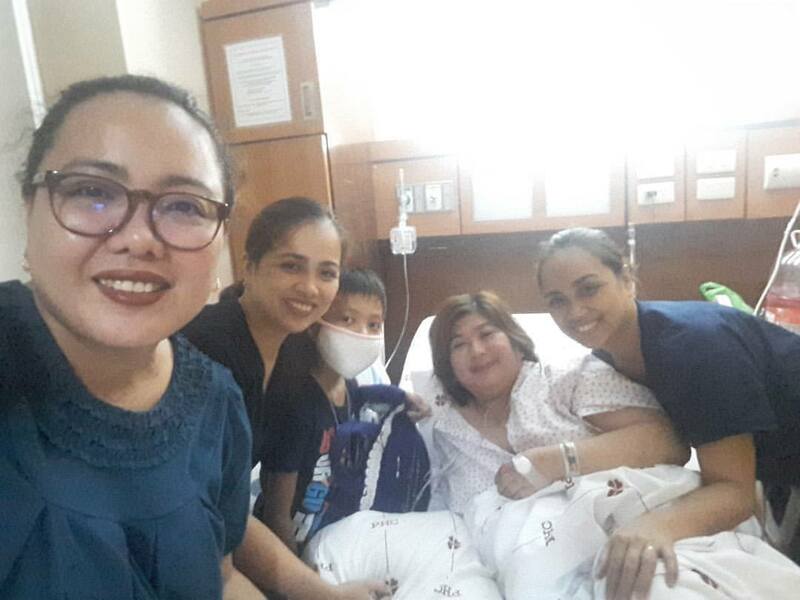 But after a bone marrow biopsy at the National Kidney and Transplant Institute (NKTI), her hematologist finally told her she’s suffering from MDS. A second child to a family of four, Meanne was born to a very religious but humble and supportive family. While parents provided her a very good comfortable life, sent her to a good school where she spent most of her happy childhood and student years, she was taught how to become responsible and hardworking to support herself and her family. “I’m workaholic. I used to stay up late. My work stressed me out because I used to handle payroll and company benefits so I don’t go home until it’s done,” Meanne said. She used to work long hours in a multinational automotive manufacturing company for 15 years as a human resource associate. She would leave the house as early as 5 a.m. and goes home at 10 p.m. When she was 18 years old, Meanne suffered endometriosis, a painful disorder in which tissue that normally lines the inside of the uterus – the endometrium – grows outside of the uterus. She would experience heavy bleeding during periods and her periods would usually last longer than five days to a week. Studies show about one-third of women with endometriosis have trouble with fertility and struggle to get pregnant. Married on September 17, 2005, Meanne and husband wanted to have her ovaries removed, but after seeking medical advices from several obstetricians, they all advised otherwise and confirmed that it’s not her ovaries that are causing the fast dropping of her hemoglobin levels so it’s safe to conceive a baby. Surprisingly after a year of marriage in 2006, Meanne and husband finally conceived a “healthy” baby, but a week before delivery, the baby died inside her womb. The couple wanted to know the reason why, but since autopsies usually take two to four hours to perform, preliminary results can be released in 24 hours, and the full results may take up to six weeks to prepare, they didn’t push through with it. It wasn’t until after she was diagnosed with MDS in 2016 when Meanne finally concluded that maybe her condition has something to do with her child’s death inside her womb 10 years ago. A fact sheet published by the American Cancer Society explained that MDS is group of cancers in which immature blood cells in the bone marrow do not mature and therefore do not become healthy blood cells. Some cases are mild, while others are more severe, and carry a high risk of becoming acute myelogenous leukemia (AML). Supportive care for MDS patients include transfusion of red blood cells (RBCs) that are deficient and treatment of infections. 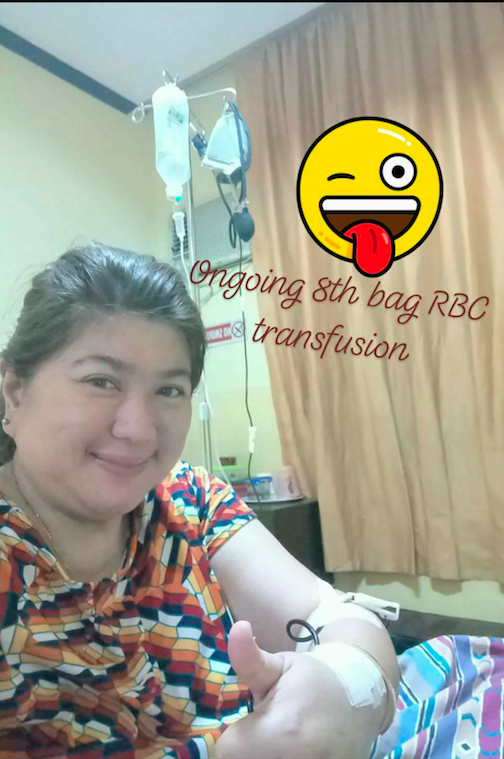 Apart from blood transfusions, Meanne started receiving oral chemo, which costed her P15,000 per 30 tablets (or one cycle). But after two cycles, she sought a new hematologist and chemo drugs. Unfortunately, iron deficiency is a common complication in cancer patients so Meanne had to undergo iron therapy which costs P10,000 per session to restore iron balance in her body. Last year, she was diagnosed with yet another illness, Bartter Syndrome, a condition caused by a defect in the kidneys’ ability to reabsorb sodium and she is losing too much sodium through urine. Alongside with her MDS, she was also diagnosed with a congenital heart disease and now she’s also having complications with her lungs. Apparently, her lungs are retaining fluids that need to be drained once in a while, which explains why she always looks bloated. Her doctors call her “living miracle” for surviving her condition and its many complications, but they worry because she has already received 190 bags of blood. Some of their patients usually have only 100 bags and die after. Blood transfusions can be lifesaving according to studies. However, it’s important that the blood is accurately matched to patient’s blood type. If not, they can be harmful to her kidneys and lungs, or can have serious reactions to the immune system. And while doctors don’t limit the number of blood transfusions over a person’s lifetime, having to get that many bloods can result to greater risk for side effects. It’s been two years of struggling financially, emotionally, and mentally for being in and out of the hospital, transfusions there and there, but instead of improving, Meanne’s case is progressing. “All in all, we’ve already spent more than P2 million for my hospitalization, medications, and confinement,” Meanne revealed. At present, Meanne relies on different charitable institutions to sustain her medications and hospital confinements like Department of Health, Philippine Charity Sweepstakes Office, Department of Social Welfare and Development, friends, family, and anonymous people. “I try to be strong. People praise me for being strong based on what they see on Facebook, but honestly deep inside, I’m really in pain. I want to give up. I just try to be okay,” revealed Meanne as tears flow down her cheeks. Apparently, Meanne’s doctors admitted that her case is already aggressive. Her hemoglobin levels are dropping so fast not to mention her many complications. “They [doctors] advised us to seek second or better opinion. My doctor almost gave me up. She told me, ‘If there’s someone better than me, it’s okay if you find another. I’m really having a hard time on your case’,” Meanne added. If she used to undergo blood transfusions after two or three months before, now the intervals are shortened to one or two weeks. From eight bags, she already reached 10-13 bags per session. “Time is important to me. When I leave the hospital, I cannot lay in bed or stay at home all day. I do everything I can to make me happy. I try to look my best,” she said. While she believes in miracles and that she knows she’ll get better soon, Meanne couldn’t help but question God. “Why me? I’m at the peak of my career, earning a living. I’m at the stage where I’m supposed to be enjoying my life, exploring. I’m just starting to explore. I gave up so many things – my friends. I don’t go out with them anymore, they visit me at home,” Meanne said. She also lamented at how some of her “friends” only know her when she had money, but now doesn’t know her anymore. Studies show that patients with chronic or life-threatening disease can easily become depressed and anxious about their health circumstances. They may have symptoms of depression: feeling helpless, hopeless, isolated, worthless, and overwhelmed. They also deal with problems with anger and interpersonal relations, or loss of interest. Knowing how to offer comfort and support to a loved one can be challenging. Doctors advise family or relatives to let their sick loved ones know that they are willing to listen to his or her concerns. Don’t underestimate the value of your presence. “Even it feels as if you’re not doing anything, your presence sends an important message. Don’t, however, try to be a counselor,” said an article published by the Mayo Clinic. At present, Meanne lives with her parents and younger siblings to find comfort while recovering. “Sometimes I’m happy. I feel blessed and grateful. But there are times, I wake up one day and think I’m getting crazy. They don’t understand, even I don’t understand myself. I cannot control my emotions, partly because I’m in pain. I’m super sensitive maybe because of the blood reactions in my body. Sometimes, I’m slow in comprehension. I also find myself disoriented. Sometimes I don’t remember my age anymore. At my worst, I just sleep and vomit and don’t want to talk to anybody.” Meanne admitted. One day, when she finally finds herself better, Meanne vows to go back to church and serve God. She will testify how God healed her and helped her through it all. “That’s what’s missing in my life. Just like the prodigal daughter [in the Bible], I want to go back to Him. Honestly, I almost lost my faith when I got sick. I’m not perfect. Nobody’s perfect, but why me Lord? But just the thought that I’m the one who’s sick and not any of my family, I’m [already] okay with that,” she said. Looking back, Meanne only wanted a simple life, a healthy and happy family, a stable job until she retires that can help her family and other people. But now she’s sick, she can only advise other patients not to lose hope, pray, and always believe in what God can do. “Miracles happen all the time. We don’t own our life, we don’t know when we are going to die, even healthy people can die anytime. Even if you’re sick, try to be a blessing to other people and become an inspiration to other people that life is still good and God is present in our lives. I’m still thankful, I’m still alive. I’m a living miracle. With God all things are possible,” she said. Our most recent visit to Meanne (center, seated) was last June 12, 2018. She just had her hair colored thus explaining why her hair looks blonde. For those who would like to help, any amount of donation would be sincerely appreciated. Please deposit to: Marie Anne Magpantay (Metro Bank: 020 3020 193094, BPI Family Bank: 005843 1945 77, or Western Union: Marie Anne Magpantay).